Hi ladies! I really felt like pink nails the other night but I didn't want a plain mani, SO I thought I would do a pink ombré manicure with some of my favourite China Glaze pink polishes =) I should do ombré nails more often - it's quick and fun! For my thumb I used 2 coats of QT; for my index finger I used 2 coats of Heli-Yum; for my middle finger I used 3 coats of Sugar High; ring finger is 3 coats of Something Sweet and my pinky is 3 coats of Encouragement. When I was deciding what pinks to use for this mani I realised just how out of hand my nail polish stash is getting (for me anyway!).. 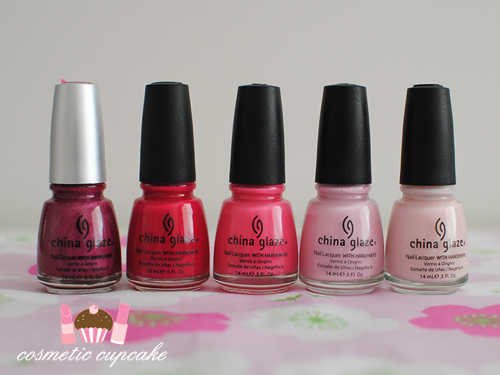 I have 10 different pinks from China Glaze alone! HAHA! What colour should I do for my next ombré manicure?! Thanks for looking! Don't forget to enter my 2nd birthday giveaway here! Lovely :) I haven't tried an ombre mani yet, but I definetly should! I ♥ Ombre nails! 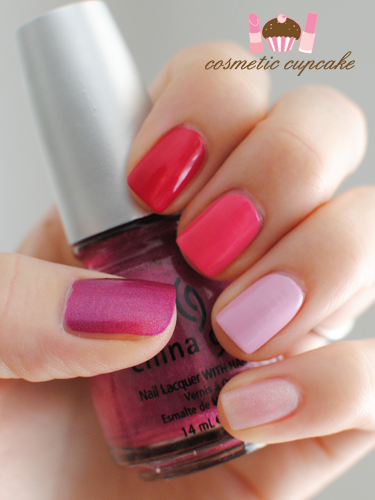 You picked great pinks to do this mani! I love ombre nails! Yours is great!